The Empire issue has arrived! The Nib’s third print magazine, Empire, is now on sale. Beginning with the cover image of Donald Trump’s face indelibly carved into Mt. Rushmore — drawn by political cartoonist Mr. Fish — the Nib magazine’s Empire issue spans 112 full-color pages of comics with original stories from around the world. The comics explore the impacts of colonization and conquest, from the Bristish Empire to modern tech empires. For the Empire issue, artists paint intimate portraits of the impact of empire on everyday life… and take some pointed jabs at powerful figures. Iraqi artist Hussein Adil shares the emotional story of a young man forced to fight, and nearly die, in the Gulf War. Malaka Gharib and Trinidad Escobar team up to create a comic about the colonial roots of a savory Filipino snack: the pimiento cheese sandwich. Andrew Greenstone reports on the rise of Dr. Bronner’s wild “All One” soap empire. Whit Taylor explains the surprisingly passionate fandom that supports The Bachelor’s takeover of TV. Tom Humberstone illustrates stolen items housed in the British Museum. Four cartoonists share stories of ways they try to decolonize their own lives — Robyn Smith, Max Loh, Niccolo Pizarro, and Mariah-Rose Marie. Artist Eleri Harris illustrates an interview with Russian journalist and influential Putin-critic Masha Gessen. Features by Vreni Stollberger, Ellen Crenshaw, Ben Passmore, and Andy Warner. Dispatches by Sofie Louise Dam, Victoria Lomasko, Rosa Colón, Spencer Ackerman, Matt Bors, and Nero O’Reilly. With strips by Ann Telnaes, Kasia Babis, Marty Two Bulls, Matt Lubchansky, Chelsea Saunders, Fionn McCabe, Brian McFadden, Gemma Correll, Joey Alison Sayers, Rob Rogers, and Mark Kaufman. 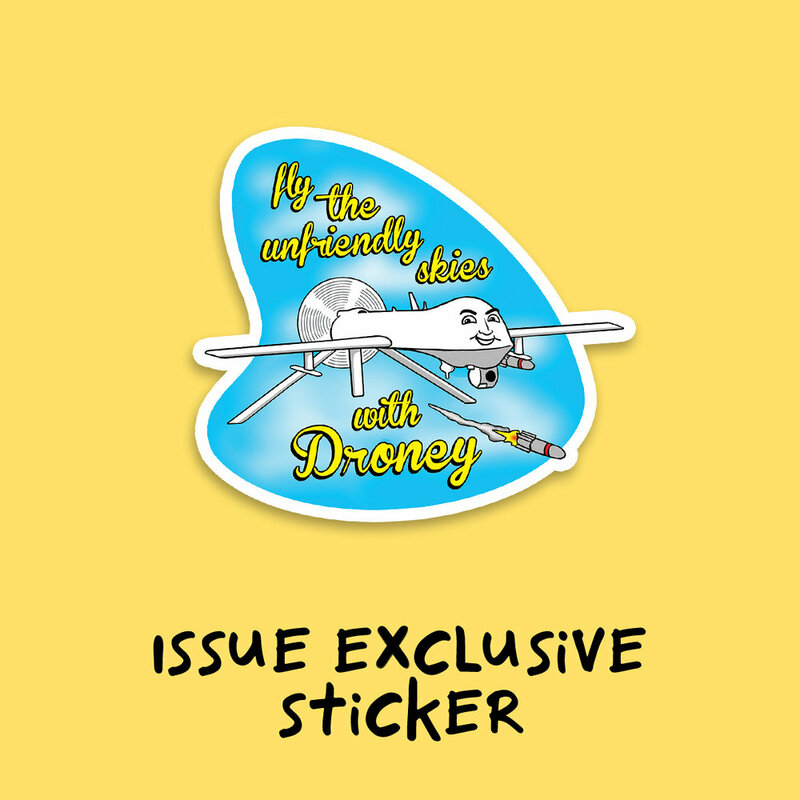 Each print issue also comes with an exclusive anti-drone war sticker designed by Tom Tomorrow. Sign up to The Inkwell, our membership program, and we’ll ship you the Empire issue directly from the printer this April. Your monthly contribution will get you each issue of our quarterly magazine and fund The Nib’s goals of supporting brilliant artists from all walks of life. Because no empire falls on its own.